A blood glucose test at home with a glucometer is a reliable method to measure your blood glucose level. 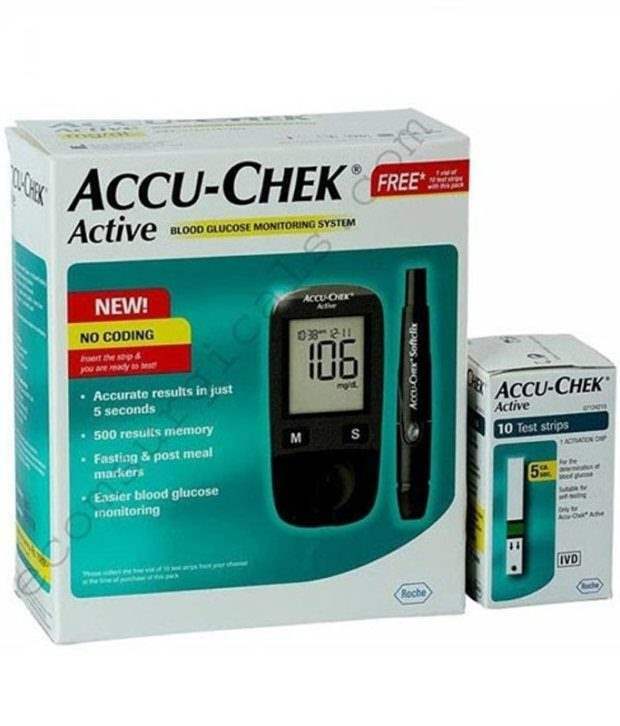 People having a family history of diabetes or suffering from type 1 or type 2 diabetes are advised by their physician to buy Accu Chek Active Glucometer for the monitoring of their blood sugar level. The testing could be performed at anytime and anyplace, with this tiny portable device. 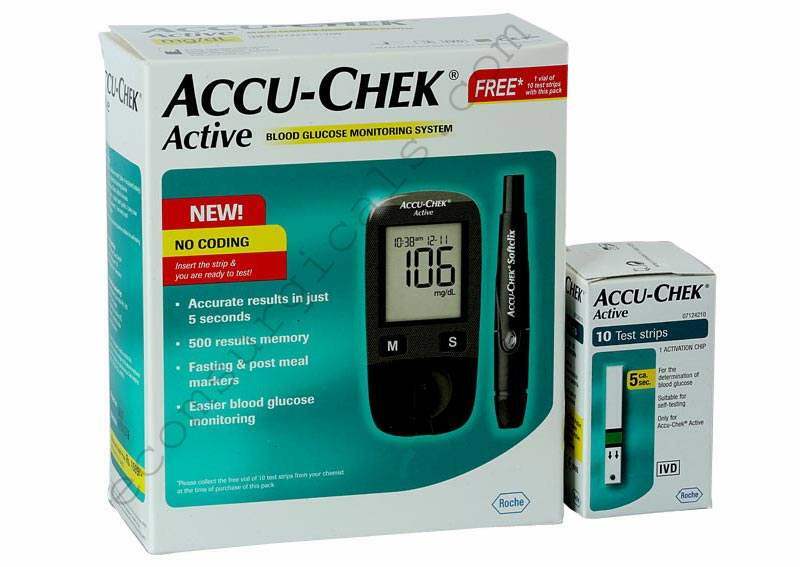 The Accu Chek Active Glucometer comes with many strong features. It is very cute and small in size. You can carry it very easily. Comparing to it’s previous version, this version doesn’t require coding. Hence number of steps for testing has reduced. Also this Glucometer displays the average of your blood sugar up to last 3 months. Another feature is strip expiry warning. Also you have the option to re-dose within 10 seconds, in case if you have under dosed. Also you can set pre-meal and post-meal reminders for testing your blood sugar with this glucometer. It gives you accurate readings. You will get almost the same reading comparing to the lab test. The no coding feature ensures an easier test for you. The display of this glucometer is large. Hence it is very easy to read. It has only 2 buttons, which ensures intuitive handling. Very safe because you have the option for checking under dose of blood and you can re-dose it within 10 seconds. Also you can double check visually. In this glucometer, pre and post-meal markers are there. Also postprandial reminder is there. You can take the test averages of 7, 14, 30 and 90 days. Can transfer the readings easily to your desktop because there is an USB interface in this glucometer. Obtain a test strip from the strip package and close the cap of strip package immediately. 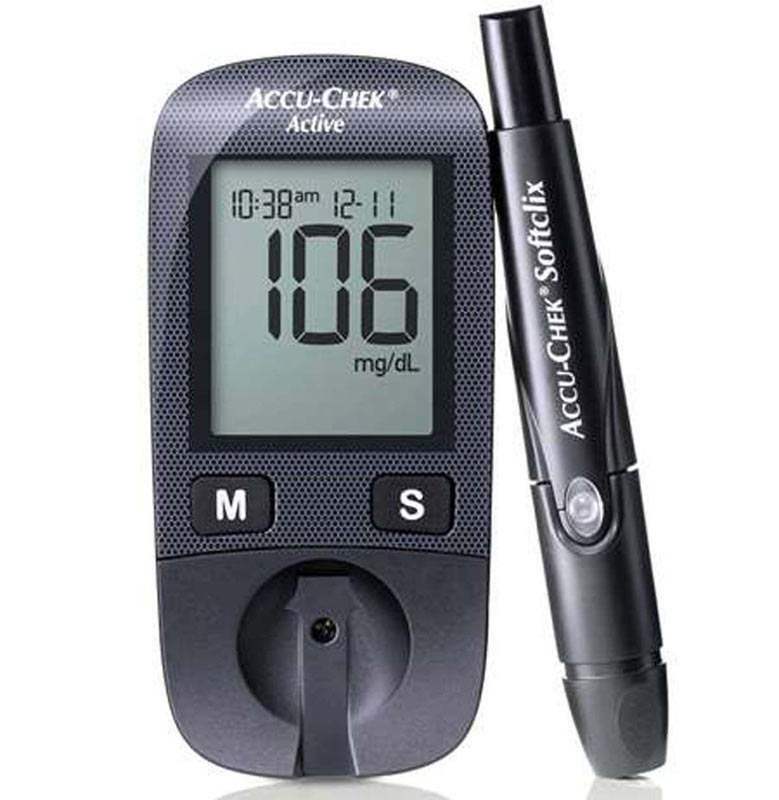 Also turn on the Accu Chek Active Glucometer by inserting the test strip on the glucometer. All Roche Glucometers are automated devices and works better in automatic mode. Use the lancing device, and always use a brand new lancet to get a drop of blood from the fingertip. A blood sample from the fingertip makes it easier to pass the blood into the test strip. Disinfect the finger with the help of alcohol swab before prick. After the prick, gently squeeze the finger if the blood drop is not prominent, but avoid touching the blood drop. Carefully put the blood drop on the strip, make it sure that the blood drop completely covers the column on the test strip. If the column on the strip is not full, the result would not be accurate. Hence complete column makes certain that glucometer has sufficient blood sample to provide you an exact reading. Once the loaded strip is filled with the sufficient amount of blood, the glucometer will countdown and display the results on its screen. If the blood sample is less than the amount necessary, you have the option to re-dose it within 10 seconds. Once the blood glucose level is displayed, you can write down the results. How to clean your Accu Chek Active Glucometer? Remove the used strip and keep it away from the strip box. Remove the lancet from the lancing device and put it into a puncture-proof bottle to avoid any accidental injuries. Then discard the used test strip and lancet. Keep the waste away from the reach of children and other animals. Wash your hands with soap and water. After applying soap, rub your hands for at least 10 to 15 seconds, following antiseptic washing guidelines. Check the strip applying area of your Accu Chek Active Glucometer properly. If any blood spot is sticked there, remove it carefully with a clean cotton. Also keep all the accessories in the carrying case and keep it in a safe place. This Product is having 10-Year Manufacturer Warranty. You need to contact the manufacturer directly for availing manufacturer warranty. Superb device in this range and it is working perfectly and showing the results accurately. Easy to use. This is the best at-home glucose monitoring system currently. You can be assured about the accuracy of the readings with this machine. Everything about this is great although its not expensive than most of its alternatives. Delivery was on time. The world class quality and technology as it is designed and made in Germany. The device available to test the blood glucose level gives the most accurate reading results in a few seconds compared to all other devices are available in the market now. The delivery was on time care with best class courier service.